ROW 1: Dc in 3rd ch from the hook and in each ch across. Ch 3. Turn. ROWS 2-32 (or until hat measures approx. 12" in height): Dc in 2nd st in from edge chain, and then across to end of row. Ch 3. Turn. Row 33: Dc as in previous rows, to end of row. Don't ch 3, just cut yarn enough to sew side seam and end off by pulling yarn through last stitch. Sew sides together using a whip stitch. For top - make a running stitch in and out of the sts of the last row of dc, and pull tightly to gather the top. Add a colorful pompom to the top to keep the top tightly shut. I run pompom tail threads under a couple of stitches and tie tightly to secure. 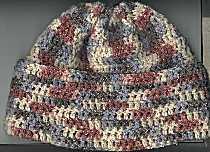 If you don't want a pompom, you can just flip hat inside out and sew the top closed nicely. Flip back to the right side, roll up a nice big, warm brim, and wear! This looks really bright and pretty if you use different colors every few rows to create colored stripes. ROW 3 continue in pattern, until hat fits around head, (30 rows for kids; 32 for teens, 34 for women; 36 for men~ approximately!) adding new colors wherever you please. You can even add them in the middle of a row for a neat variety. 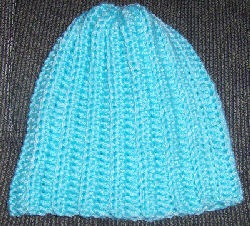 When hat is wide enough, whip stitch the sides together, then weave around the top of hat and pull tightly to form top. * © COPYRIGHT: All content is copyrighted to original creators. You may direct LINK to pages, but you may not post patterns anywhere in any media form. Any items made from patterns © to Beverly Qualheim may be sold, but please make one for charity too.